You can shift the playback position of regions on a track using the Delay parameter. Positive values shift regions ahead in time (laid-back playing style or dragging), while negative values shift regions back in time for a pre-delay (driving or rushing the music). The Delay value is shown in both ticks and milliseconds. 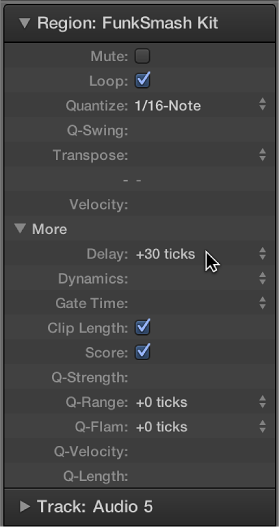 Click the left area of the Delay parameter, then drag up or down to set the value. Click-hold the right area of the Delay parameter, then choose a value from the Delay pop-up menu. The attack phase of the sound is too slow. A good musician will automatically compensate for this by playing the notes slightly early. With very slow sounds, you may need a pre-delay of over 100 ms to even them out. The sound generator is reacting too slowly to the incoming note on messages. Older multi-timbral sound generators often take tens of milliseconds before outputting a voice. The delay in output is not constant, as it is dependent on the order of notes arriving at the external MIDI sound generator. You should therefore try pre-delaying rhythmically important tracks by as little as one tick—it can work wonders on timing.